Order online now to take advantage of our low service fee, or place your order by phone at (800) 266-0452 (outside the U.S. (225) 927-1062). A $19.95 service fee ? will be added to the price of the arrangement when ordering online. The service fee added to the price of the arrangement is $23.90 when ordering by phone. This item can be delivered the same day if your order is placed before 9:00 AM in France Tuesday - Friday. 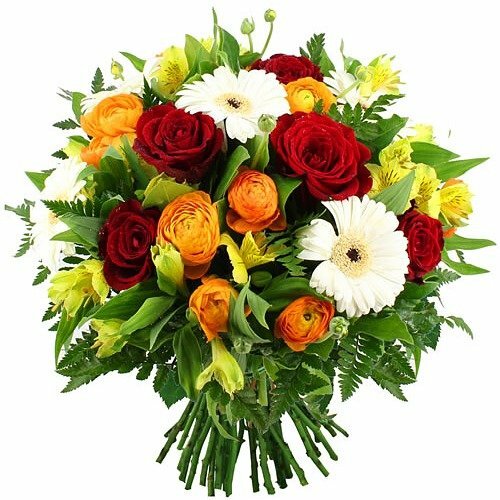 Monday delivery must be requested before 11:00 am Saturday, and Saturday deliveries must be ordered before 3:00 pm US Eastern time on Friday..
* Suggestions emailed by 1st in Flowers are always just what I need!